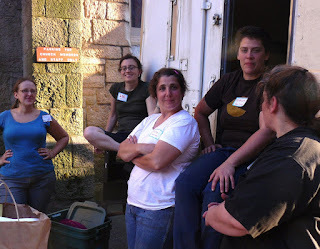 Chefs' Maggie Zaccara (center) and Evelyn Whitbeck-Poorbaugh (right) of the Hope & Olive Restaurant in Greenfield created the menu for the Free Harvest Supper. This recipe for Turkey and Peach Salad included turkey donated by Diemand Farm in Wendell and peaches from Clarkdale Fruit Farms of Deerfield. Last Sunday (8-17) in Greenfield, the Free Harvest Supper drew a crowd of over 700 people with 45 farmers and producers donating everything from kombucha to tomatoes to cheese to corn to ice cream to turkey. People were urged to bring their own place settings, got to know their neighbors, had some gourmet local food and some exhibited symptoms of being high on life. 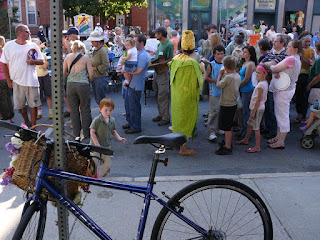 Although Joe Cocker was not in their number, performance artists including an electric banjo player and hoola hoop dancer entertained a mellow crowd. Behind-the-scenes organizer, Juanita Nelson, peace activist and original visionary for the Harvest Supper says, "the big idea is people eat local food at the festival and do likewise when they go home." Although there was a bit of tension during the planning stages when it was revealed that potatoes, beans and tomatoes were in short supply due to the rainy summer. A miracle of the loaves and turkey took place when people ponied up with more of everything to fill in the gaps. Under the dinner tent were platters turkey and peach salad, heirloom tomato slices, wheatberry salad with tiny blueberries and local bread. While Juanita (who lives off the grid) is very happy with the success of this year's festival, she wonders why more citizens don't tear up their lawns and grow some food instead. Why indeed? 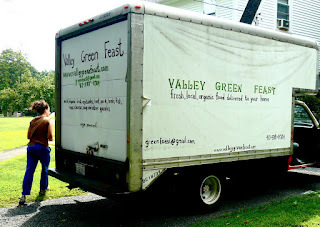 Jessica Harwood's Valley Green Feast is a modern day version of the service provided by milkmen of yore. This farm to table triathlon goes far beyond milk and eggs. From behind the wheel of an old U-Haul outfitted with a freezer, Jessica races around the Valley gathering eggs, produce, fruit, cheese, lamb, beef, bread and other local delights in the wee hours. She is responding to orders from customers that have been e-mailed in during the week. Around 10 am, she parks near some tobacco fields in Sunderland where the fruits of everyone's labor are distributed into individual boxes for local delivery. By 3 pm, blueberries that came out of a flat purchased from Czajkowski Farm in the morning are being consumed as a snack at a conference table in West Springfield and Warner's Corn in Sunderland (Mike's Maze) has been dropped off in boxes on the doorstep of twenty happy recipients from Amherst to Springfield. The charge for this service is around $25 per box with a small delivery charge depending on the number of people receiving the order. The 29-year-old entrepreneur has created the business with $3,300 from Smith and UMass entrepreneurship contests plus some of her own money. How does she do it? With a vegetable oil powered truck and the ardor of a true preservationist for ferreting out local food that doesn't stop at zucchini. There is goat cheese, grass-fed beef, ricotta cheese, prepared soups, the famous farmed Barramundi from Turner's Farm and bread. The following is from a recent e-mail to the faithful: "Delivered to your door, you will receive tomatoes, beans, cukes, greens, beans, berries, and squash for canning and freezing, along with directions on how to do it." A Cambridge native, active gleaner and proponent of local food, this entrepreneur is hugging the shores of the Connecticut to bring food fresh from the farm to your door.